The latest development code for the CSS Validator is available through the GitHub Repository. 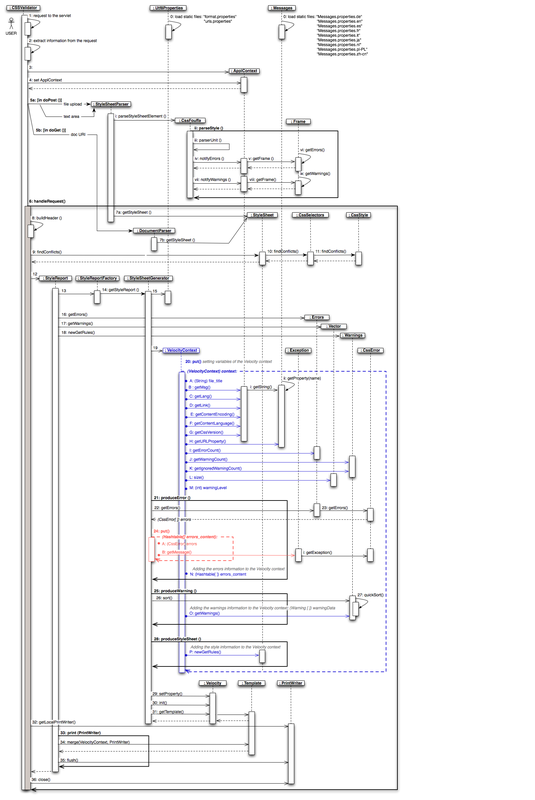 For a visual representation, see the CSS Validator Sequence Diagram, which is available in png, graffle and svg formats. If you have any questions or problems with the validator, send us an email. The parser generated with JavaCC 0.7.1. You'll probably not want to see this directory. All values for the parser to construct an expression. All cascading style sheet level 1 properties (+ css2 and some of css3). The validator is here ! In servlet mode, URL like file are desactivated. Be careful with URL, you can put a URL request so if your site have special authorization to access web pages, it should be dangerous to run the validator on it. You can desactivated all URL request with the init parameter 'import'. Set this parameter to 'false' (default) means any URL request (except file:) are authorized. see the javadoc documentation for more informations on the servlet. How can you add your owns properties ? How to launch the validator on your local system. You have a lot of configuration files in the validator (in Java, it means properties). The default CssStyle to use when parsing a document. All HTML elements recognized by a selector. All warning and error messages used by the parser. Inheritance controls for all CSS1 properties.